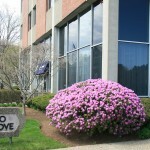 40 Grove Street | Haynes Management, Inc.
One of the few buildings in Wellesley Square that offers plenty of free, on-site parking. Many amenities are located within walking distance; such as banks, a post office, and many restaurants, stores, hair salons and other service establishments. In the heart of Wellesley Square next door to the Wellesley Public Library. This suite offers a reception area, conference room, four offices and a storage room.